Striker Aaron O'Connor admits there were times he thought he would not feature for Newport County in League Two this season. Last season's top scorer, O'Connor, has been troubled by groin problems all season and underwent surgery. He made his comeback as a second half substitute in County's 2-2 draw at AFC Wimbledon on Good Friday. "It got to the point where I said If I played this season it would be a bonus," O'Connor said. "It's good to finally get out there. It's been a long, boring, repetitive 11 months. "It was good to be part of a half decent result, a point away from home." 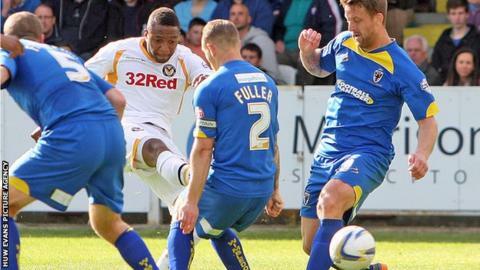 The 30-year-old scored one of Newport's two goals against Wrexham in last season's Conference Premier play-off final which secured promotion to the Football League. The former Luton Town player now hopes to put the injury nightmare behind him. "Hopefully I can use the experience and do my best to try and prevent anything like it happening again," O'Connor added. "I've learnt a lot from physios and nutritionists in terms of the body and how it works and how to help prevent certain issues that I've had. "I can take that along with me now and hopefully prevent anything like this happening again. "I'll use the summer to get myself in tip-top condition and then come back next year and put this year behind me." Manager Justin Edinburgh said O'Connor is expected to play some part against Burton Albion at Rodney Parade on Monday, but is unlikely to start. "I think between now and the end of the season it's a case of building his match minutes up," said Edinburgh. "Obviously we'll have to see between now and Monday how he reacts but hopefully it will be positive and we can get him some more minutes Monday."